Naturally, Mac computers will work smoothly with iPhones, but what if you have an Android? And you are not the only one who prefers an Android phone over an Apple product. So finding an Android file transfer for Mac is vital for many. There are great options out there to sync and transfer files between Mac OS X and Android, you just have to find the right one. In this article we have reviewed some of the best apps for Mac Android file transfer. First comes SyncMate. This app has a galore of various features and actually supports multiple other devices too (if you may ever need another sync direction). This app allows mounting Android devices as separate Mac disks. You'll be able to freely browse through Android phone or tablet folders and transfer files back and forth. Simply drag the files onto the required folders. Fast, easy, reliable. 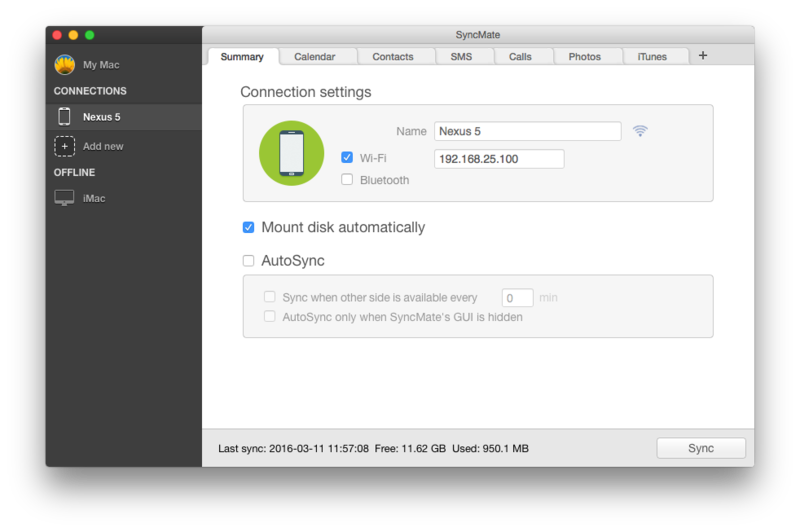 As much as file transfer is a good enough solution, SyncMate can actually sync data between Mac OS X and Android. Sync is different from just transfer, data gets updated on both devices and it can be done automatically without you having to move a finger. SyncMate supports contacts and calendar sync; photos, music, playlists and folders can also be synced. 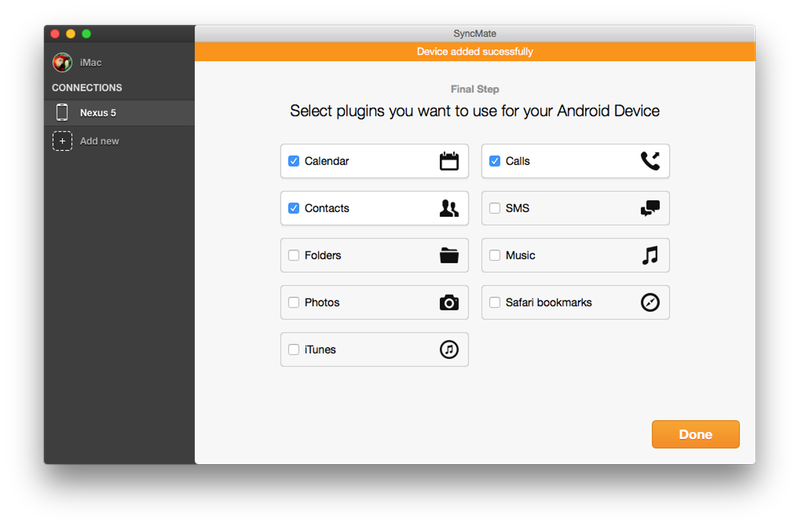 The main advantage of SyncMate is that it syncs data directly between apps on your Mac and Android. So as you can see, SyncMate is not just a tool to transfer files from Android to Mac and vice versa, but a perfect synchronization app for these devices as well, which makes it much more versatile and handy and lists first in our rank of best Android file transfer for Mac apps. 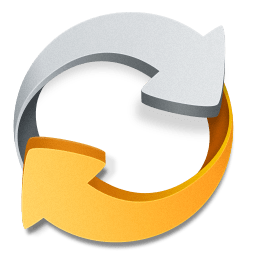 How to use SyncMate as Android File Transfer Mac? Download SyncMate and install it on your Mac. Files transfer between Mac and Android is available within “Mount disk” option. This feature is offered in Expert edition so you will need to upgrade your Free version. You can upgrade here (our advice is to test SyncMate Free Edition prior upgrading to Expert). To connect your Android to Mac click “Add New” in the left panel and choose Android device. Connect your Android to your Mac using USB cable (in this case SyncMate Android module will be automatically installed on your device). After Android device is connected, go to “Summary” tab and choose “Mount disk” option. That’s all. 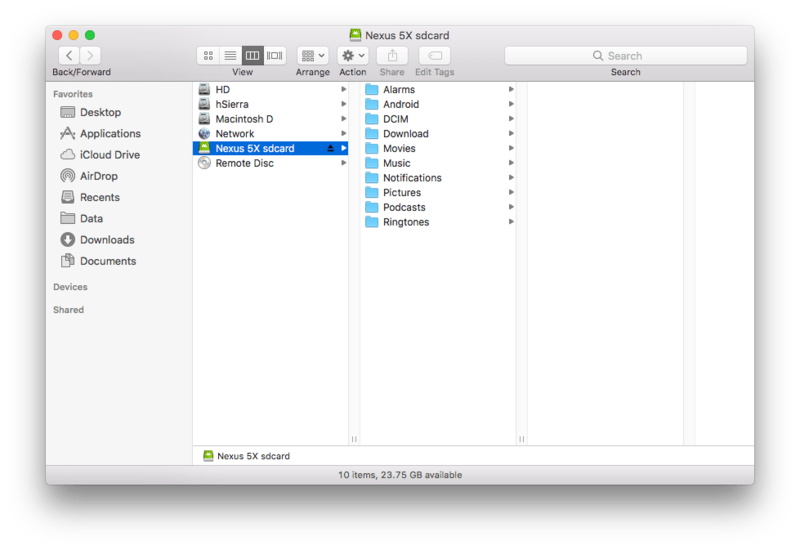 Go to Finder and you’ll see Android in the list of macOS disks. Choose folder you need to transfer data to or from and move it as needed. This is a different type of app than SyncMate, but still worth the attention. 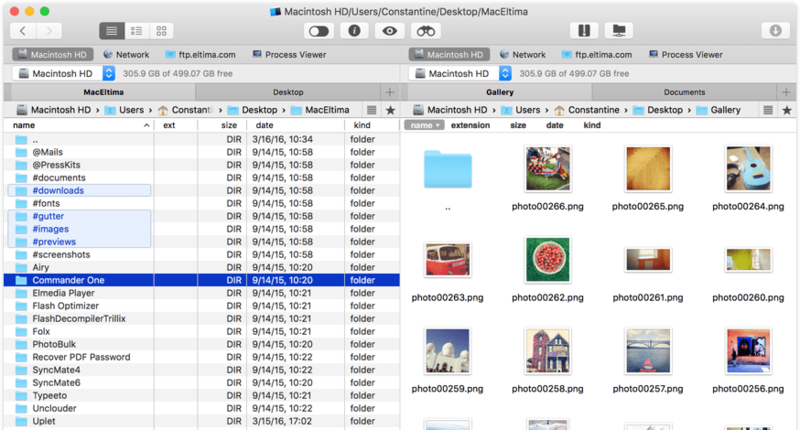 Commander One allows you connecting Android device to Mac OS X via USB and immediately seeing it in this file manager as a Mac disk. Now you can work with your device just as with any other local drive. Because this app is dual-panel Android file transfer for Mac OS X is a real no-brainer there. In Commander One you can also connect to the most popular cloud storage service, browse files on iOS devices, work with archives and hidden system files, use Terminal Emulator and manage current system processes. Android File Transfer Mac by Google is the only native utility that could be rather helpful in file transfer, but unfortunately it has not been updated for several years and the interface is not easy to understand. Also it doesn't let you transfer more than one file at a time, so it may just take forever to get the job done. This little app allows data transfer over LAN and is available for Windows, Mac OS X, Android and Symbian systems. It is rather compact and only offers one feature, that is file transfer. Not bad, in fact does the same that Android File Transfer for Mac from Google, but supports more platforms. 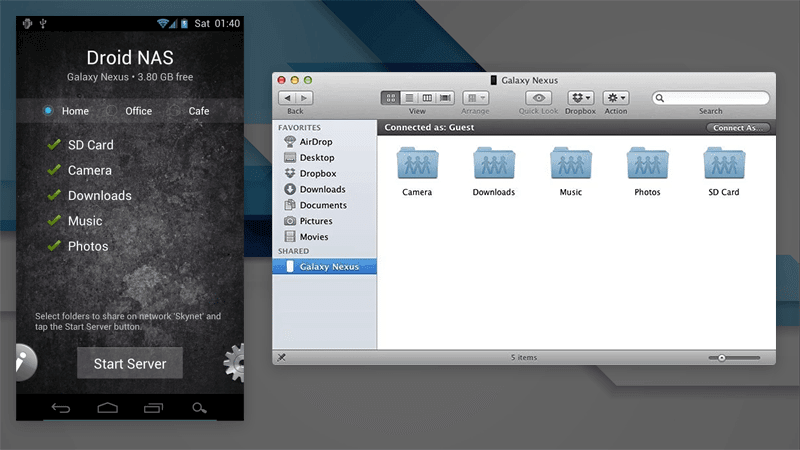 With Droid NAS you can transmit files back and forth between your Mac and an Android device. 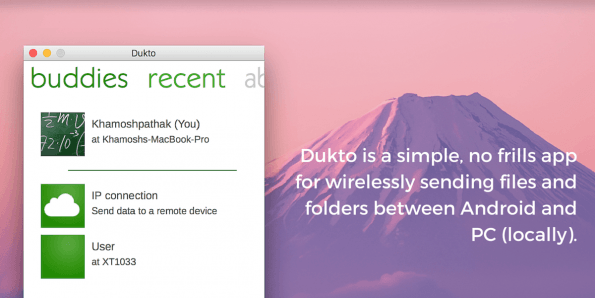 This app works via Wi-Fi and the built-in Bonjour protocol inside macOS. To transfer files with this app you'll need to get both your computer and mobile device connected to the same wireless network. UPD: currently Droid NAS is not available for download, not sure if this is a permanent problem, but we’ll still leave it on our list of best Android file transfer Mac apps for now. Using cloud storages is also an option even if not the most convenient one. It adds an extra step to the process but is helpful when you don't have other options. You may already have a Dropbox or SugarSync account and can make use of those. Dropbox is one of the oldest and most popular not a platform specific cloud storage. It became so popular because it offers free cloud storage space. Moreover, the fact that Dropbox allows sharing stored data with others even if they don't have a Dropbox account adds scores to its flexibility. And even though this service is not an Android file transfer one per se, you can use Dropbox for your Android files - just install it on Mac and Android and upload or download data from or to your Dropbox account (personal data like contacts and calendar events are not supported, just file transfer). SugarSync is similar to Dropbox, but is less popular. Cloud storage space it provides can be used for data and folders transfer. Your stored data can be shared with others; you can also remove the data from all devices in case of loss or theft. 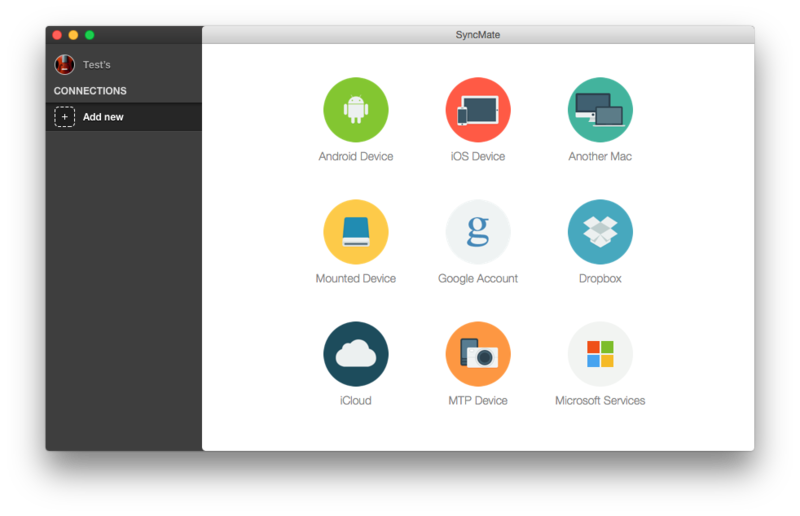 Like Dropbox, SugarSync supports all major platforms and can be used as Android file transfer Mac. How did we rate Android file transfer Mac apps? Let’s start with the fact that there are just a few apps that can transfer files between Android and Mac OS X. After Apple removed their built-in Sync Service several years ago, all apps that used it to sync data between macOS and Android, stopped working. And since transferring files between Mac and Android is not a common task like video playback or image editing, you won’t find hundreds of apps offering sync and transfer services. 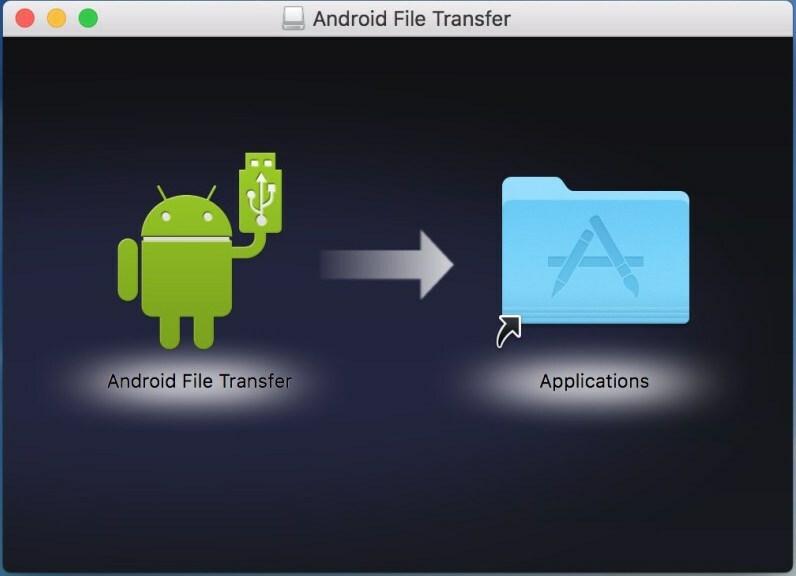 Key factors we considered while choosing the best Android file transfer for Mac. Functionality. The app worth your attention must be able to transfer all data types - media, folders, personal (like contacts or calendar events). Who wants to install several apps to keep ALL data between Mac and Android updated if all of that can be done within one app? Flexibility. Data sync and transfer are complicated processes so Android file transfer Mac apps should provide you with wide range of data transfer settings. OS support. Android OS as well as macOS are constantly updated and the app you will buy should support the latest versions. App lifecycle. App should be constantly updated so you are sure you are getting the most current features and you can see that the developers are actually there, working on the product and not just letting it sit while everything else is moving forward. Thanks for reading through the list of Android file transfer Mac apps - choose what suits you best and keep data updated between your Mac and Android!